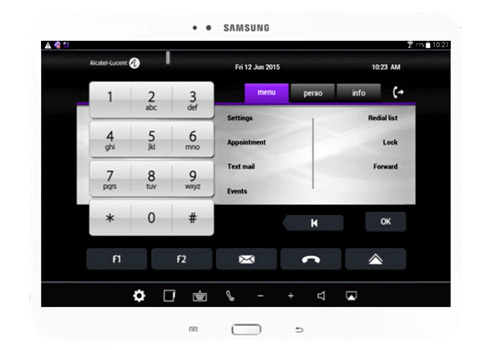 Alcatel-Lucent IP Desktop Softphone is an application installed on a user’s desktop (PC or Mac), tablet or smartphone (iOS and Android™ mobile devices). This multimedia, fully-integrated telephony solution completely replaces physical phones. The IP Desktop Softphone emulates an Alcatel-Lucent 8068 Premium DeskPhone. The application is quick and easy to install. User friendly, it accommodates customization’s to suit user preferences. This application makes it transparent for remote workers to phone and to be called as long as they are connected to their company network using a VPN over the Internet. VoIP protocol provides all 8068 Premium Desk-Phone telephony features on the computer, tablet or smart-phone. Available on the OmniPCX® Office Rich Communication Edition (RCE) under Microsoft Windows, Apple Mac OS and iOS.